It’s the photo every grandmother treasures – a family portrait with all her grandchildren and great-grandchildren to mark a special birthday. And we’re certain this stunning image of Queen Elizabeth and the youngest members of the royal family will soon be taking pride of place on a wall at Windsor Castle. The portrait, taken by photographer Annie Leibowitz inside the castle’s majestic Green Drawing Room. 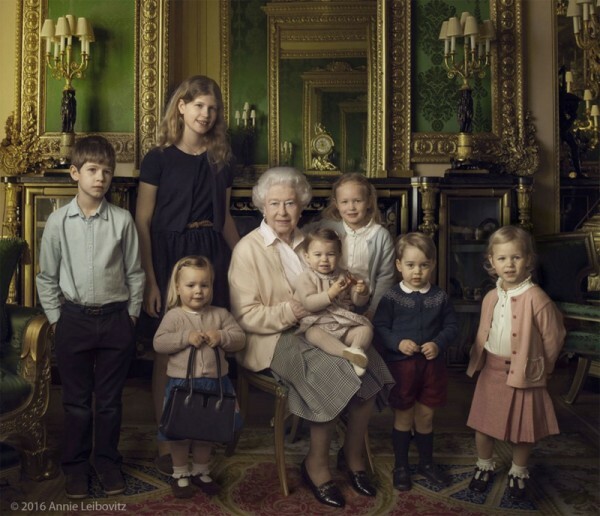 shows the Queen proudly holding the littlest royal, Princess Charlotte, on her lap while her other grandchildren and great-grandchildren crowd around. There’s Prince George – a favourite of ours already at Babyology – with his adored “gan-gan” as well as great-grandchildren Mia Tindall, 2, and sisters Isla and Savannah Phillips, 3 and 5, all grandchildren of the queen’s only daughter, Princess Anne. Just look at little Mia holding the Queen’s handbag. Adorable. Prince Edward’s kids – and Queen Elizabeth’s youngest grandchildren – James, Viscount Severn, 8, and Lady Louise, 12, also appear. The images, including this close-up shot, were released by Kensington Palace today as part of celebrations to mark the Queen’s 90th birthday. She is now the longest serving British monarch. And we can’t help love this other photograph, released earlier this week, that shows Prince George stealing the show at his first photoshoot for the Royal Mail. 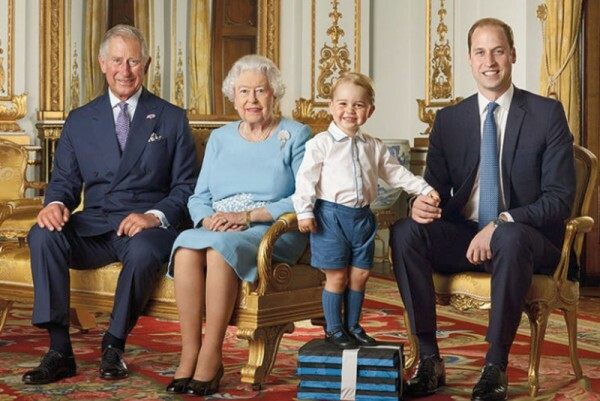 The cheeky youngster will appear on his first stamp, in a set to honour four generations of the royal family on the Queen’s birthday.